In “TED’s secret to great public speaking,” Anderson wanted his viewers to know how great public speaking works and how it connects to the audience. Anderson tells his audience of how an idea that is being presented can change a person’s perspective on how they look at the world referring back to my annotations on his video. An idea is important. How? Well, by presenting an idea to a person, it connects with their minds. The presenter gets to tell its idea and it will then have the audience see the same idea as the speaker. That is one of the ways of becoming a great public speaker, it is to transfer your idea to the listener’s mind. Then the audience and yourself will sort of be on the same page. Sometimes the audience may not connect with the idea because it is not something they are not interested in. To be a great public speaker, it is best to present your idea in a way that engages the audience. Be prepared to have listeners who wouldn’t careless about what you are saying. The best way to bring those listeners in is by how you present your idea. There are different ways to capture audience attention. The speaker just have to find a way that works best for him/herself and with the audience. From watching, “Good and Bad Examples of Presentation”, what I understand is that while presenting everything is important and looked at. Like for example the way you speak, your tone, your body posture, the rhythm and flow of how you present, how to dress, what to do, and there’s many more. But what I learned is that you have to be prepared and ready to do the best you can. This video just demonstrates what not to do and what to do. Most of what this video was trying to say, I already knew already. I guess it’s just common sense. I understand that for a good presentation, appearance is part of it. Dress the part. And from what I understand that for a bad presentation, just don’t do the obvious like answering your phone while presenting or chewing gum. You are trying to give your audience a good first impression. For me, the thought of speaking and presenting in front of an audience or just people in general, well it’s nerve-racking. From my experiences, I would always get that tickling feeling that’s happening inside my stomach and nervous facial expressions, but it’s like once you get up there and start presenting, time starts ticking down. Nervousness will probably still be there while your speaking, but then you will just start to go with the flow. I believe that if you know what you are talking about and know your idea or topic that you are going to present, it’s a lot easier to be less nervous. Because you know what your going to say and you would know how to say it. I think everyone gets nervous before presenting or speaking in front of a group of people. I guess that’s the way human beings are generated for their bodies to react a certain way when it comes to different situations. So if you are nervous when you are going to speak and present, you are not alone. Mostly everyone feels that way as well. Nervousness will then starts to die down if you keep practicing and presenting all the time. You would start to get use to it and it would get easier. Tips on Public Speaking by Agnes is licensed under a Creative Commons Attribution-ShareAlike 4.0 International License. 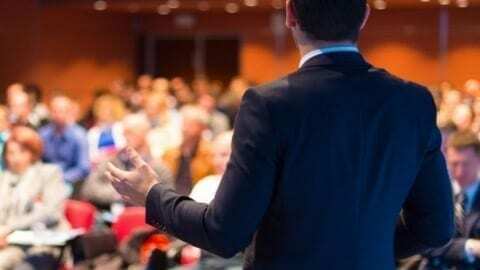 Public speaking has always been a fear a mine, and a continuous struggle for me so these tips will really help me. And I am sure others as well.